Rady. It’s a familiar name to those living in San Diego. And to families whose children have visited the Hospital, it invokes feelings of hope, healing, and a long-standing commitment to our community’s children. 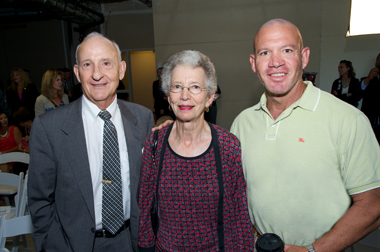 In August 2014, Ernest Rady and family made an extraordinary investment in the health and well-being of children by pledging $120 million to establish the Rady Pediatric Genomics and Systems Medicine Institute. The gift was the largest donation ever made to Rady Children’s Hospital Foundation and secures Rady Children’s place at the leading edge of research, discovery and innovation into childhood disease and injury. The transformational gift wasn’t the beginning for the Rady family’s commitment to the Hospital. It spans decades and generations. In 2006 Ernest, his family and American Assets, Inc. (a company Ernest founded) pledged $60 million in support of the Hospital’s planned expansions in facilities and programs. The gift was the largest ever made to the Hospital and the second largest naming gift to any children’s hospital in the U.S. In recognition of his gift, the Hospital’s Board of Trustees voted unanimously to rename the institution Rady Children’s Hospital-San Diego. This exceptional gift ensured the completion of the Acute Care Pavilion (ACP), which opened in 2010. The ACP offers state-of-the-art technology in a family-centered healing environment and is home to the Peckham Center for Cancer and Blood Disorders, a Neonatal Intensive Care Unit with home-like private rooms and the Warren Family Surgical Center. Since this time, Ernest has supported many of these services with additional gifts – in creative and meaningful ways. For his 70th birthday, he offered a $1 million matching gift to those who made a gift to the Hospital in honor of his special celebration. And earlier in the Hospital’s history, he made significant donations for the Rose Pavilion: the main entrance lobby and the second floor Medical/Surgical Center are named for Dr. Max and Rose Rady, a tribute to Mr. Rady’s parents. Along with their generous gifts, Ernest and the Rady family have donated their time and passion in making Rady Children’s a world-class institution. During the 1980s and 1990s, Ernest served as a member of the Children’s Hospital and Health Center Board and Chair of the Board from 1990 to 1993, during which time he oversaw construction of the Hospital’s Rose Pavilion, the largest expansion project in the institution’s history. Harry Rady, Ernest and Evelyn’s son, serves as a member of the organization’s Board of Trustees and is Chair of the IT Task Force and Investment Committee. In 2003, in recognition of his unwavering dedication to upholding and advancing excellence in medical care for the children of San Diego and beyond, Ernest received the Hospital’s highest volunteer honor, the Thomas F. Carter Leadership Award. While this may be true, the honor is all ours. Rady Children’s is deeply grateful for the faith and trust the Rady family has placed in the Hospital. Their philanthropy is a profoundly important expression of hope and healing for our region’s children and families, and we wouldn’t be where we are today without them.